Literature review is a precondition for an effective and efficient movement for any study. Review of the relevant literature prompts and strengthens to assess approaches to the problem and revise the plan accordingly. For making the report a standard one, I have gone through the articles downloaded from internet. I have also kept my eyes on various texts collected from various sources. Finally, I have given some practical examples on merger in order to make the report comparable and verifiable. This review has helped me to focus on the shortcomings of the previous works, tools and techniques used by the bank for study, weakness of their methodology and to reduce duplication of works. A merger occurs when two companies combine to form a single company. Mergers and acquisitions refer to the aspect of corporate strategy, corporate finance and management dealing with the buying, selling, dividing and combining of different companies and similar entities that can help an enterprise grow rapidly in its sector or location of origin, or a new field or new location, without creating a subsidiary, other child entity or using a joint venture. Merger allows the newly formed entity to run without delay because it has almost all the necessary assets and equipments. However, side by side with some additional benefits of merger, there are some disadvantages of merger because the entities in the pre-merger period were not working well. Despite some disadvantages, merger process helps the weak entities to survive from being destroyed. The merger process will no doubt change in the near future, as dynamic technologies allow for the development of a more streamlined marketplace which manages to protect the privacy of interested companies while linking up ideal candidates for a merger. One plus one makes three: this equation is the special alchemy of a merger or an acquisition. The key principle behind buying a company is to create shareholders’ value over and above that of the sum of the two companies. Two companies together are more valuable than two separate companies – at least, that’s the reasoning behind merger and acquisition. A merger is usually handled by an investment banker, who aids in transferring ownership of the company through the strategic issuance and sale of stock. Some have alleged that this relationship causes some problems, as it provides an incentive for investment banks to push existing clients towards a merger even in cases where it may not be beneficial for the stockholders. The entire merger process is usually kept secret from the general public, and often from the majority of the employees at the involved companies. Since the majority of merger attempts do not succeed, and most are kept secret, it is difficult to estimate how many potential mergers occur in a given year. It is likely that the number is very high, however, given the amount of successful mergers and the desirability of mergers for many companies. ü Synergy: Synergy is the magic force that allows for enhanced cost efficiencies of the new business. Synergy takes the form of revenue enhancement and cost savings. Economy of Scale: This refers to the fact that the combined company can often reduce its fixed costs by removing duplicate departments or operations, lowering the costs of the company relative to the same revenue stream, thus increasing profit margins. Economy of Scope: This refers to the efficiencies primarily associated with demand-side changes, such as increasing or decreasing the scope of marketing and distribution, of different types of products. Increased Market Share: This assumes that the buyer will be absorbing a major competitor and thus increase its market power to set prices. Cross-selling: Through the merger process, a manufacturer can acquire and sell complementary products. Taxation: A profitable company can buy a loss maker to use the target’s loss as their advantage by reducing their tax liability. Geographical or Other Diversification: This is designed to smooth the earnings results of a company, which over the long term smoothes the stock price of a company. Resource Transfer: Resources are unevenly distributed across firms and the interaction of target and acquiring firm resources can create value through either overcoming information asymmetry or by combining scarce resources. Hiring: some companies use acquisitions as an alternative to the normal hiring process. This is especially common when the target is a small private company or is in the startup phase. Absorption of Similar Businesses under Single Management: Sometimes the similar types of business entities are merged to bring them under the single management. Horizontal Merger: Horizontal merger occurs when two companies that are in direct competition and share the same product lines and markets merge together. 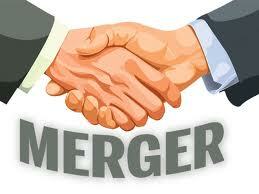 Vertical Merger: Vertical merger occurs when a customer and company or a supplier and company merge together. Market-Extension Merger: Market-extension merger occurs when two companies that sell the same products in different markets merge together. Product-Extension Merger: Product-extension merger occurs when two companies selling different but related products in the same market merge together. Conglomeration: Conglomeration occurs when two companies that have no common business areas merge together. Purchase Mergers: As the name suggests, this kind of merger occurs when one company purchases another. The purchase is made with cash or through the issue of some kind of debt instrument; the sale is taxable. Consolidation Mergers: With this merger, a brand new company is formed and both companies are bought and combined under the new entity. The tax terms are the same as those of a purchase merger. Although often used synonymously, the terms merger and acquisition mean slightly different things. The legal concept of a merger (with the resulting corporate mechanics, statutory merger or statutory consolidation, which have nothing to do with the resulting power grab as between the management of the target and the acquirer) is different from the business point of view of a “merger”, which can be achieved independently of the corporate mechanics through various means such as “triangular merger”, statutory merger, acquisition, etc. When one company takes over another and clearly establishes itself as the new owner, the purchase is called an acquisition. From a legal point of view, the target company ceases to exist, the buyer “swallows” the business and the buyer’s stock continues to be traded. In the pure sense of the term, a merger happens when two firms agree to go forward as a single new company rather than remain separately owned and operated. This kind of action is more precisely referred to as a “merger of equals”. The firms are often of about the same size. Both companies’ stocks are surrendered and new company stock is issued in its place. For example, in the 1999 merger of Glaxo Wellcome and SmithKline Beecham, both firms ceased to exist when they merged, and a new company, GlaxoSmithKline, was created. In practice, however, actual mergers of equals don’t happen very often. Usually, one company will buy another and, as part of the deal’s terms, simply allow the acquired firm to proclaim that the action is a merger of equals, even if it is technically an acquisition. Being bought out often carries negative connotations; therefore, by describing the deal euphemistically as a merger, deal makers and top managers try to make the takeover more palatable. Whether a purchase is considered a merger or an acquisition really depends on whether the purchase is friendly or hostile and how it is announced. In other words, the real difference lies in how the purchase is communicated to and received by the target company’s board of directors, employees and shareholders. Investors in a company that are aiming to take over another one must determine whether the purchase will be beneficial to them. In order to do so, they must ask themselves how much the company being acquired is really worth. Naturally, both sides of an M&A deal will have different ideas about the worth of a target company: its seller will tend to value the company at as high of a price as possible, while the buyer will try to get the lowest price that he can. Price-Earnings Ratio (P/E Ratio): With the use of this ratio, an acquiring company makes an offer that is a multiple of the earnings of the target company. Enterprise-Value-to-Sales Ratio (EV/Sales): With this ratio, the acquiring company makes an offer as a multiple of the revenues, again, while being aware of the price-to-sales ratio of other companies in the industry. Discounted Cash Flow (DCF): A key valuation tool in M&A, discounted cash flow analysis determines a company’s current value according to its estimated future cash flows. Forecasted free cash flows (net income + depreciation/amortization – capital expenditures – change in working capital) are discounted to a present value using the company’s weighted average costs of capital (WACC). Admittedly, DCF is tricky to get right, but few tools can rival this valuation method. Payment by cash: Such transactions are usually termed acquisitions rather than mergers because the shareholders of the target company are removed from the picture and the target comes under the (indirect) control of the bidder’s shareholders. Payment with stock: Payment in the form of the acquiring company’s stock, issued to the shareholders of the acquired company at a given ratio proportional to the valuation of the latter. There are some elements to think about when choosing the form of payment. When submitting an offer, the acquiring firm should consider other potential bidders and think strategically. The form of payment might be decisive for the seller. With pure cash deals, there is no doubt on the real value of the bid (without considering an eventual earnout). The contingency of the share payment is indeed removed. Thus, a cash offer preempts competitors better than securities. Taxes are a second element to consider and should be evaluated with the counsel of competent tax and accounting advisers. Third, with a share deal the buyer’s capital structure might be affected and the control of the buyer modified. The risk is removed with a cash transaction. Then, the balance sheet of the buyer will be modified and the decision maker should take into account the effects on the reported financial results. For example, in a pure cash deal (financed from the company’s current account), liquidity ratios might decrease. On the other hand, in a pure stock for stock transaction (financed from the issuance of new shares), the company might show lower profitability ratios (e.g. ROA). However, economic dilution must prevail towards accounting dilution when making the choice. The form of payment and financing options are tightly linked. In general, stock will create financial flexibility. Transaction costs must also be considered but tend to have a greater impact on the payment decision for larger transactions. Finally, paying cash or with shares is a way to signal value to the other party, e.g. : buyers tend to offer stock when they believe their shares are overvalued and cash when undervalued. It’s no secret that plenty of mergers don’t work. Despite the goal of performance improvement, results from mergers and acquisitions (M&A) are often disappointing. Numerous empirical studies show high failure rates of M&A deals. Studies are mostly focused on individual determinants. Those who advocate mergers will argue that the merger will cut costs or boost revenues by more than enough to justify the price premium. It can sound so simple: just combine computer systems, merge a few departments, use sheer size to force down the price of supplies and the merged giant should be more profitable than its parts. In theory, 1+1 = 3 sounds great, but in practice, things can go awry. Historical trends show that roughly two thirds of big mergers will disappoint on their own terms, which means they will lose value on the stock market. Motivations that drive mergers can be flawed and efficiencies from economies of scale may prove elusive. The In many cases, the problems associated with trying to make merged companies work are all too concrete. Coping with a merger can make top managers spread their time too thinly and neglect their core business, spelling doom. Too often, potential difficulties seem trivial to managers caught up in the thrill of the big deal. The chances for success are further hampered if the corporate cultures of the companies are very different. When a company is acquired, the decision is typically based on product or market synergies, but cultural differences are often ignored. But remember, not all mergers fail. Size and global reach can be advantageous, and strong managers can often squeeze greater efficiency out of badly run rivals. Nevertheless, the promises made by deal makers demand the careful scrutiny of investors. The success of mergers depends on how realistic the deal makers are and how well they can integrate two companies while maintaining day-to-day operations. ExxonMobil Corporation was formed in 1999 by the merger of two major oil companies, Exxon and Mobil. The merger of Exxon and Mobil was unique in American history because it reunited the two largest companies of John D. Rockefeller’s Standard Oil trust, Standard Oil Company of New Jersey/Exxon and Standard Oil Company of New York/Mobil, which had been forcibly separated by government order nearly a century earlier. This reunion resulted in the largest merger in US corporate history. Exxon had better return on assets (6.75%) and return on equity (14.57%) ratios (Mobil’s were 3.95% and 9.01% correspondingly). This situation represented Exxon’s better efficiency at using investment funds (shareholder’s equity) to generate earnings growth. Exxon was more stable and effective in using its assets, while Mobil was more volatile and risky. On June 16, 1998, Mr. Lee R. Raymond, Exxon’s CEO, met with Mr. Lucio A. Noto, Mobil’s CEO, at Mobil’s headquarters in Fairfax, Virginia. At the meeting, Mr. Raymond and Mr. Noto had preliminary discussions about the possibility of a combination of the two companies. Later management continued discussions and permanently informed the Boards. Near-term operating synergies: $2.8 billion in annual pre-tax benefits from operating synergies (increases in production, sales and efficiency, decreases in unit costs and combining complementary operations). A year later, pre-tax annual savings were re-assessed and increased to $3.8 billion. Capital productivity improvements: Management also believed the combined company could use its capital more profitably than either company on its own. These improvements were realized due to efficiencies of scale, cost savings, and sharing of best management practices. Combined company showed even superior results after the merger, which proved the correlation between positive market reaction on the announcement event and success of the merger. Productions: ExxonMobil is the largest non-government owned company in the energy industry and produces about 3 percent of the world’s oil and about 2 percent of the world’s energy. ExxonMobil, like other oil companies, is struggling to find new sources of oil. According to Wall Street Journal it replaces only 95% by volume of the oil it pumps. This stands in contrast to natural gas, where it replaces 158% by volume through purchases or finds. ExxonMobil is a signatory participant of the Voluntary Principles on Security and Human Rights. Revenue and Profits: In 2005, ExxonMobil surpassed Wal-Mart as the world’s largest publicly held corporation when measured by revenue, although Wal-Mart remained the largest by number of employees. ExxonMobil’s $340 billion revenues in 2005 were a 25.5 percent increase over their 2004 revenues. In 2006, Wal-Mart recaptured the lead with revenues of $348.7 billion against ExxonMobil’s $335.1. ExxonMobil continued to lead the world in both profits ($39.5 billion in 2006) and market value ($460.43 billion). In 2007, ExxonMobil had a record net income of $40.61 billion on $404.552 of revenue, an increase largely due to escalating oil prices as their actual oil equivalent production decreased by 1%, in part due to expropriation of their Venezuelan assets by the Chavez government. As of July 1, 2010, ExxonMobil occupied 8 out of 10 slots for Largest Corporate Quarterly Earnings of All Time. Furthermore, it occupies 5 out of 10 slots on Largest Corporate Annual Earnings. GlaxoSmithKline plc (GSK) is a British multinational pharmaceutical, biologics, vaccines and consumer healthcare company headquartered in London, United Kingdom. It is the world’s third-largest pharmaceutical company measured by revenues (after Johnson & Johnson and Pfizer). GSK was formed in 2000 by the merger of GlaxoWellcome plc (formed from the acquisition of Wellcome plc by Glaxo plc), and SmithKline Beecham plc (from the merger of Beecham plc, and SmithKline Beckman Corporation). In 1880, Burroughs Wellcome & Company was founded in London by American pharmacists Henry Wellcome and Silas Burroughs. The Wellcome Tropical Research Laboratories opened in 1902. In 1959 the Wellcome Company bought Cooper, McDougall & Robertson Inc. to become more active in animal health. The Wellcome Company production centre was moved from New York to North Carolina in 1970 and the following year another research centre was built. In 1830, John K. Smith opened its first pharmacy in Philadelphia. In 1865 Mahlon Kline joined the business which, 10 years later, became Smith, Kline & Co. Subsequently, in 1891, it merged with French, Richard and Company. It changed its name to Smith Kline & French Laboratories as it focused more on research in 1929. Years later, Smith Kline & French Laboratories opened a new laboratory in Philadelphia; it then bought Norden Laboratories, a business doing research into animal health. GSK employs over 90,000 people worldwide, according to GSK website, including over 40,000 in sales and marketing. Its global headquarters are GSK House in Brentford, United Kingdom, with its United States headquarters based in Research Triangle Park (RTP) in North Carolina and its consumer products division based in the Pittsburgh suburb of Moon Township, Pennsylvania. The research and development division has major headquarters in South East England, Philadelphia and Research Triangle Park (RTP) in North Carolina. GSK has a portfolio of products for major disease areas including asthma, cancer, virus control, infections, mental health, diabetes and digestive conditions. It also has a large consumer healthcare division which produces and markets oral healthcare and nutritional products and over-the-counter medicines including Sensodyne, Boost, Horlicks and Gaviscon. In November 2009 GlaxoSmithKline formed a joint venture with Pfizer to create ViiV Healthcare. Viiv Healthcare received all of Pfizer and GlaxoSmithKline’s HIV assets. ViiV Healthcare is 85% owned by GlaxoSmithKline and 15% owned by Pfizer. GSK has a primary listing on the London Stock Exchange and is a constituent of the FTSE 100 Index. As of December 2011, it had a market capitalization of £73.8 billion, the fifth-largest of any company listed on the London Stock Exchange. It has a secondary listing on the New York Stock Exchange. The merger of legendary Walt Disney and everything-we-create-kids-adore Pixar was a match made in cartoon heaven. Disney had released all of Pixar’s movies before, but with their contract about to run out after the release of “Cars,” the merger made perfect sense. With the merger, the two companies could collaborate freely and easily. Disney and Pixar had a tight relationship; Pixar made the movies, which were co-financed and distributed by Disney. The partnership has been hugely profitable for both sides, generating over $3 billion in box office revenues over 12 years. Yet the relationship slated to end this year had shown signs of fraying as Jobs negotiated a new contract with former Disney boss Michael Eisner. Jobs is reportedly in talks to sell Pixar to Disney. Pixar shares are worth about $7 billion, having risen handsomely over the last year—even if they haven’t quite matched those of Apple, which have more than doubled. But Jobs has a far bigger stake in the animation studio than he does in Apple: His roughly 50% ownership of Pixar is worth over $3.5 billion, which would be more than enough to turn him into Disney’s largest individual shareholder should he accept a stock swap. Did the merger work? Well, take a look at the successful movies that Disney and Pixar have put out since: “WALL-E,” “Up,” and “Bolt.” Pixar has plans for twice-yearly films, unthinkable before the merger, and has certainly gained the expert advice from Disney when it comes to advertising, marketing plugs, and merchandising. When it comes to marketing to children, no one does it better than Disney. Even pre-merger cartoon “Cars” got the Disney treatment and remains a top seller in merchandising amongst 4 year old boys. The union of producer Pixar and distributor Disney has teetered at times on the brink of irreconcilable differences. They maintain separate homes – Pixar up north in Emeryville and Disney in Burbank. But the two creative companies maintain enough common interests that they’ve stuck together. There’s no denying they’ve produced some beautiful collaborations that are the envy of Hollywood. “Ratatouille,” “Wall-E” and “Up” have all garnered critical praise and boffo box office. Then there’s the “Toy Story” franchise. Part One – the first result of a distribution deal Disney and Pixar signed early in their courtship – showed the world what their partnership could do. Part Two continued the antics of Woody, Buzz and their friends. And “Toy Story 3” won such acclaim that it just might deliver an anniversary gift – a Best Picture nod when the Academy of Motion Picture Arts and Sciences announces its Oscar nominations tomorrow morning. M&A comes in all shapes and sizes, and investors need to consider the complex issues involved in M&A. The most beneficial form of equity structure involves a complete analysis of the costs and benefits associated with the deals. DePamphilis, Donald (2008). Mergers, Acquisitions, and Other Restructuring Activities. New York: Elsevier, Academic Press. pp. 740. ISBN 978-0-12-374012-0. Cartwright, Susan; Schoenberg, Richard (2006). “Thirty Years of Mergers and Acquisitions Research: Recent Advances and Future Opportunities”. British Journal of Management 17 (S1): S1–S5. doi:10.1111/j.1467-8551.2006.00475.x. Harwood, I. A. (2006). “Confidentiality constraints within mergers and acquisitions: gaining insights through a ‘bubble’ metaphor”. British Journal of Management 17 (4): 347–359. doi:10.1111/j.1467-8551.2005.00440.x. Fleuriet, Michel (2008). Investment Banking explained: An insider’s guide to the industry. New York, NY: McGraw Hill. ISBN 978-0-07-149733-6. Straub, Thomas (2007). Reasons for frequent failure in Mergers and Acquisitions: A comprehensive analysis. Wiesbaden: Deutscher Universitäts-Verlag (DUV), Gabler Edition Wissenschaft. ISBN 978-3-8350-0844-1. Aharon, D.Y., I. Gavious and R. Yosef, 2010. Stock market bubble effects on mergers and acquisitions. The Quarterly Review of Economics and Finance, 50(4): p. 456-470.